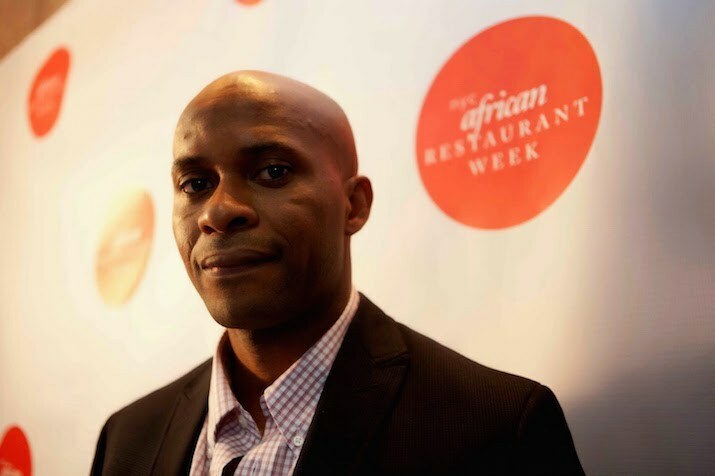 Akin Akinsanya speaks on building NYC's African culinary empire ahead of the 2015 New York African Restaurant Week. African cuisine has arrived in New York City. That's the message that Akin Akinsanya, the founder and Executive Producer of New York African Restaurant Week (NYARW), wants to get across. The Nigerian-born Wall Street consultant felt the momentum was there a few years ago, particularly with innovations like African Fashion Week NY. "I wanted to create a platform to bring people together," he explains. "It's an opportunity to celebrate the food and the culture together." He launched NYARW in the fall of 2013 to an immediate media buzz. Once he got the ball rolling, he found that chefs and restaurant owners began to approach him. "It got bigger and bigger. We have more chefs involved this year. The event is growing – this year over 25 restaurants are involved." NYARW is now a biannual happening. Along with special prix fixe menus at a number of restaurants, the week will also see a number of live music and DJ’ed events. The first annual Ms Iya Oge Food & Fashion Showcase will combine the work of the city's up-and-coming crop of African designers with samplings from a variety of restaurants. As the population of Africans in the city continues to grow, so does the number of African restaurants. "There are over 50 African restaurants in the metropolitan area," Akin says. Some have stayed the distance, like Massawa, a family-owned business specializing in traditional dishes from Ethiopia and Eritrea that opened over 25 years ago in Morningside Heights. Their tried and true approach to the favorites has meant continued success and a diverse clientele. According to Akin, many of the city’s African restaurants have stuck close to their roots, like Brooklyn's Jollof Restaurant and its menu of traditional Senegalese dishes like yassa ganar (chicken braised in onion and lemon sauce) and fried plantains, or Farafina Café Lounge in upper Harlem, where traditional West African dishes like Kan Kan Kan Lamb Dibi (charcoal grilled lamb steak with onion sauce) are on the menu. "I think it's still very authentic although people are getting more creative," Akin says. Others take a more liberal approach to traditional African culinary methods and ingredients. One such place is chic Harlem eatery The Cecil, who were named Esquire’s Best New Restaurant in America 2014 for their fusion of Asian, American and African cuisines. Their menu offers choices like West African Chicken Suya and Collard Greens Salad along with creations like Afro/Asian/American Jumbo. The restaurant’s location itself is significant - The Cecil was the former home of Minton's Playhouse, the legendary nightclub where Thelonious Monk once played on the keys and bebop was born. Lenox Saphire is a flashy high-end addition to the mix where you can sample French pastries along with traditional West African dishes for what they're calling the "Afro-Harlem experience." It's not only a Harlem or Brooklyn phenomenon, though. African cuisine has made it downtown too. The Ponty Bistro's first location (a newer one recently opened in Harlem) is located near Gramercy Park. Senegalese-born owners and Executive Chefs Alhadji A. Cisse and Chekh Cisse (the first African contestant and finalist on Food Network's Chopped) are cousins who've created a contemporary version of West African and Senegalese cuisine using European methods. Their menu offers a fusion of French, African, and Mediterranean dishes like Niokolokoba, which features grilled sirloin marinated in Senegalese spices with an optional au poivre sauce. For Akin, adding to the recognition of African chefs and African cuisine is a goal he had in mind from the beginning. "I must say I'm very proud," he admits. "Doing this in the African way is becoming more common. More people are becoming aware of African cuisine. I've not only made more people aware of it, I've brought them together." "I see this becoming an institution in New York City," he says. New York African Restaurant Week 2015 takes place May 31st through June 14th.